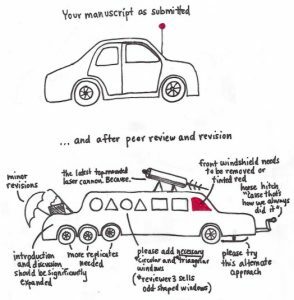 Most manuscripts are not accepted upon their first submission for publication, in fact, most are rejected without peer review (I will write about rejection criteria in one of my next blogs). This type of rejection is often done by the editor within 24 hours to a week after submission. Immediate rejection is a frustrating experience, and you may be disappointed or angry, but it is no reason to despair. You just need to choose another journal, change the layout of the manuscript to match the new journal´s format, and submit it again. If your manuscript is not immediately rejected, it will be read and commented on by two to four peer reviewers. Their combined opinions of your manuscript can lead the editor to select one of the following options: accept ´as is´ which is a very rare decision; accept pending minor revision; accept pending major revision; or reject. In the last case, you are back to square one and will need to choose a new journal to submit to. You may first want to have a good look at the reviewers´ comments though and try to improve your chance of getting your manuscript accepted by the next journal by revising your manuscript. If the reason for rejection is that the reviewers found a major flaw in your data or methods you should not try to submit it anywhere else but move on instead. If the reviewers suggested that your manuscript needs to be revised before it can be accepted you get a second chance at getting it just right. The reviewers´ comments usually consist of a list of minor and major suggestions for improvement that you need to deal with. These suggestions can include for instance having to add more experiments, rewriting part of your manuscript, adding or removing tables or figures, explaining some of the content better, expanding the background or discussion section, using more appropriate statistical analysis, or correcting typos. Most of the suggestions will be truly helpful and improve your manuscript. If the amount or type of additional work requested by the reviewers for a major revision is, however, too much or not feasible, you may want to consider submitting your article to a different journal. If you decide to go ahead and revise your manuscript then start out with the response to the reviewers. Write the title of your manuscript at the top, as well as the manuscript number and the name of the first author. Now write a short, polite paragraph thanking the reviewers for their time and effort (remember peer reviewers are all just volunteers and colleagues in your field) and the useful suggestions they have come up with. If you feel their suggestions improved your manuscript (usually they do) you may want to say so here as well. Then state something like: below you will find a point-by-point reply to the reviewers’ comments. Now copy all reviewers´ comments in there -you may need to separate some of the points- and number them if needed. Also, copy in the editor´s comments if any suggest revision. Next, start to answer the comments one by one. When you make changes to your manuscript based on the comments, make sure you do this with ´track changes´ on or indicate changes in some other way (follow the editor´s instructions). You do not need to make changes in your manuscript based on every comment as some may be plain wrong, based on a wrong assumption, or not feasible. You do, however, need to address every comment in the response, so explain why you decline to follow suggestions if you do. Take your time and do not leave any comments unanswered. Stay polite even if you do not agree with a reviewer´s opinion. After resubmitting the revised manuscript and the response the editor will usually ask the original reviewers to assess the changes you made and the answers you gave. An additional round of revisions is sometimes asked for, especially when major revisions were requested. When only minor revisions were requested the editor will sometimes review the revisions her or himself. If you addressed all or most points it is unlikely that your manuscript is rejected at this stage. Hurray! Manuscript before and after submission. Illustration by Jason McDermott of RedPenBlackPen.